Born in N.J and traveling around the world at an early age exposed Bob to various cultures and life styles. 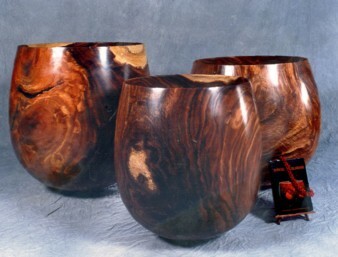 As a teenager he'd cut firewood for his parents,in doing so he saw the beauty in some of the wood. Too nice to burn he thought His Dad gave him a table saw and he started making jewelry boxes and his brother would sell them, sure beats the paper route. Bob was really inspired by his industrial arts teacher in his early high school years in eureka Calif. His Dad and family were transferred to Hawaii and Bob was impressed with all the woods available to the woodcarvers here. 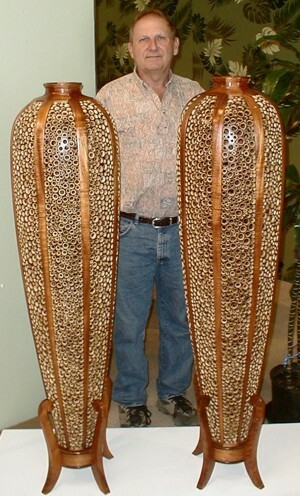 He entered a contest for the industrial arts high school competition and won with a pair of lamps. Once again the family was on the move and Bob graduated from high school in Florida and enlisting in the Coast Guard. He eventually was stationed in Hawaii again and traveled through out the Pacific. In his spare time he'd make bowls and furniture for House Of Kalai.